Every now and again, somebody tries to tell Erik Frieberg the same story they told him six years ago—that the iPhone is made for play, and that the iOS operating system isn’t really built for business and enterprise use. Frieberg’s eyes tell him differently. If iOS originally snuck in the boardroom’s back door and adapted, then iOS 7 strolled confidently in the front door, jammed with new features to help businesses protect their data, encourage intraoffice collaboration, and communicate with customers. “Certainly, on the enterprise front, this was one of the largest leaps forward from an operating system perspective,” said Wayne P. DeCesaris, senior vice president for managed solutions at Tangoe, which manages computing and communications networks for major companies, including PricewaterhouseCoopers, eBay, and Clear Channel. You might even say that iOS is the most corporate-friendly OS on the market right now. After iOS 7 launched this fall, Macworld spoke with a number of enterprise experts to get a better look at how the new operating system will play in the business arena. The consensus? There’s a lot to like—and some stuff that still needs to be done. “You might even say that iOS is the most corporate-friendly OS on the market right now,” Frieberg says. Device security: Who knows better than Apple that a smartphone loaded with sensitive work-related data…and then forgotten on a bar stool is a disaster waiting to happen. Enterprise experts welcomed iOS 7’s new security features. Activation Lock makes stolen phones tough for thieves to crack. For instance, once you designate your device as lost, whoever is in possession of it can’t restore or reactivate it. The new iPhone 5s also offers a fingerprint-activated lock that works in conjunction with the passcode. 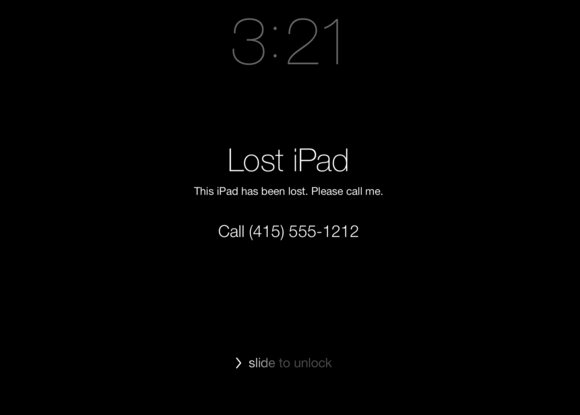 Once you activate Lost mode, a lost (or stolen) device locks with a passcode, and your phone number and message appear on the screen. App security and management: Many iPhones still enter the workplace on a “bring your own device” basis—meaning employees own them and use them both for personal and professional use. That dual use creates opportunities for a company’s sensitive data to escape into the real world. iOS 7 includes a number of features that help IT departments manage employees’ access to corporate apps and data. A slew of iOS 7 features are geared to help IT managers keep business activity separate from personal business on employees’ devices. For starters, iOS 7’s new Per App VPN feature makes it possible for specific apps used and distributed by companies to be configured to automatically connect to the company’s virtual private network (VPN) to transmit their data, while a user’s personal apps cannot. iOS 7 also includes features that limit data to third-party apps unless a passcode has been entered and that allow IT technicians to wirelessly configure company-managed apps. According to Apple, companies will soon be able to withdraw an app license from a departing employee and redistribute it to somebody else on the team—saving money (buying one app instead of two) and making it more difficult for a disgruntled worker to carry sensitive data out the door with them. Distributing apps has gotten easier, as well. New to iOS 7 is an Enterprise Single Sign-on feature that lets users access their company’s whole suite of apps by entering a passcode just once. Tools for teamwork: Matt Cutler, CEO of Kibits, applauds iOS 7’s new AirDrop function, which allows nearby iPhone users to exchange files. That feature helps power his company’s app, Collaborate, which encourages team-building and information-sharing in the workplace. Right now, the feature is used mostly for sharing pictures, but Cutler believes it could end up being transformative in the workplace. 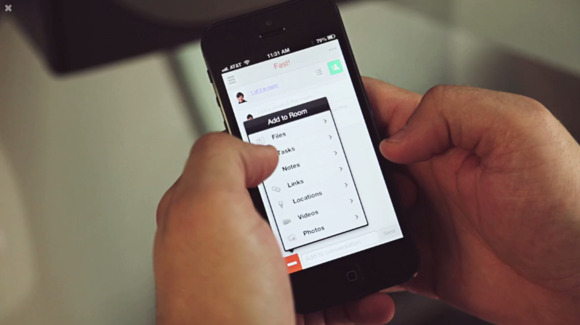 iOS 7’s AirDrop feature has opened the way for a new generation of sharing apps, like Kibits’s Collaborate, seen here. Widespread adoption: One thing that iOS 7 has going for it—like earlier versions of the OS—is widespread adoption of the latest version among potential users. Some of this is due to technical reasons (iOS easily updates over the air), but it means that businesses don’t generally have to deal with users spread out over many versions of the operating system. One estimate suggested that 52 percent of all iOS devices were updated to iOS 7 one week after it was released—and previous versions of iOS had adoption rates of above 90 percent. Compare that to Android phones, where just 33 percent of users are reportedly using any version of the operating system released within the last year. Supporting only one operating system version makes life easier on an IT department, which otherwise has to watch a growing fragmentation of phones and operating systems. Free office apps: And, oh yeah, lots of experts like that the iWork suite of apps is now free for new iPhones running iOS 7—a move that “signals Apple’s move to compete with Microsoft’s free Office and appeal to the enterprise user,” said Tim Panagos, chief technical officer for Point.io, which creates collaborative enterprise apps for businesses. Despite the list of goodies provided by iOS 7, enterprise experts said they still want more. Several, for example, said battery life could be better. Most of the wish-list items, however, were more abstract. Many said they’d like a return to less-fragmented days when nearly every worker in nearly every company carried a BlackBerry—for work purposes only—giving companies more control over their data and how employees communicate it. Many said they’d like a return to less-fragmented days when nearly every worker in nearly every company carried a BlackBerry—for work purposes only. For example, despite the arrival of Per App VPN and similar technologies, companies still worry that data might be leaked (purposefully or not) from their own apps into other apps an employee carries on a phone—a proprietary spreadsheet, for example, making its way into a worker’s personal Dropox or Google Drive account, and then out into the world from there. “They don’t have a good conception of how to separate what’s happening in a user’s personal life and what’s happening in a user’s professional life,” Good’s Herrema said. It would also help beleaguered IT departments, several experts said, if Apple and its rivals got together to create a single standard for enterprise uses. But nobody expects that. Despite these shortcomings, the experts consulted by Macworld seemed uniformly impressed by iOS 7.